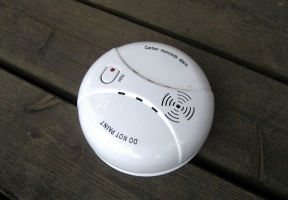 Seven people are alive today because they had Carbon Monoxide (CO) detectors installed in their homes, officials of the Town of Cicero said Thursday. A Cicero family of seven was alerted to extremely high levels of carbon monoxide in their home at 1918 s 58th Court, in Cicero this morning. Four of the residents were transported to McNeal Hospital for a safe health evaluation, but three others at the residence declined treatment, Fire officials said. No one was seriously injured but Cicero Fire Officials said it could have been a lot worse if the homes did not have CO-Smoke Detectors installed. “There could have been seven casualties if the residents had not installed CO-Fire Detectors in their home,” said Dominick Buscemi, Cicero Fire Chief. “The detectors they had installed were issued to them through a program sponsored by Town President Larry Dominick and funded through FEMA last year in which Carbon Monoxide/Smoke detector combinations were given away at no cost to all Cicero homeowners.” Cicero received a $130,000 grant from FEMA last year to replenish its supply of CO-Smoke Detector combinations that are given to each home (two per household). Cicero also received CO/Smoke Detectors from Luri Children’s Hospital.